Camden Midtown Atlanta is urban living at its best with our studio, one, two and three bedroom apartment homes. Enjoy the city skyline views or street-level retail shops and restaurants such as Torched Hop, Nancy’s Pizza, Too Groovy, Krispy Kreme and more. There are so many features that will give you the feeling of home. The open kitchens feature stainless appliances, custom espresso cabinetry, quartz countertops, subway tile backsplash, and USB outlets for easy device charging. The full-size washer and dryer, oversized walk-in closets and built-in bookshelves make urban living even easier. If you’re lucky, a mezzanine loft with a spiral staircase will be available; talk about awesome! A piece of history is unique to our community. The Gladstone Apartment Building was constructed in the early 1900’s. The original 8 apartments on the first two floors have authentic hardwood floors, large open rooms, and a sunroom. This historic building is comprised of eight one bedroom apartments and four studio apartment homes. All twelve apartments offer unique interior features; some even with exposed, painted brick walls. Breathe easy at our non-smoking amenities. Enjoy the saltwater pool and sundeck or let your inner chef shine at one of the outdoor grills. Get work done in the business center, easily email documents to the WiFi printer and print with a code. Stay in top shape and save on a gym membership by using equipment that includes the newest yoga, cardio equipment, and free weights. Work up a sweat and then quench your thirst using our reverse osmosis water fountain that is big enough to fill water bottles. We even have a private Dog Park for our four-legged residents! Downtown Atlanta parking is made easier in our controlled access parking garage. Enjoy the local historical hot spots like Mary Mac's Tea Room, The Varsity, and the Fox Theater. Soak in some history at the MLK Jr. National Historic Site or get some fresh air at the Freedom Park Trail and Krog Street Market. We are less than a mile to Georgia Tech and four miles to Emory University. In the heart of the city, we are right around the corner from some really great Atlanta venues like the Georgia Aquarium, World of Coca-Cola, College Football Hall of Fame, Children’s Museum of Atlanta, CNN Studio Tours, Centennial Olympic Park, Philips Arena, Georgia Dome, Underground Atlanta, Ponce City Market, Historic Fourth Ward Park, etc. Convenience is right around the corner with the public transportation of the Atlanta Beltline and MARTA or get anywhere in the city that you need to go from I-75/85. Come home to Camden Midtown Atlanta, and expect to #LiveUrbanATL. Call today to make an appointment to see your new Midtown Atlanta apartment home! Get the perfect spot! We have ample open parking for our residents and visitors within our controlled access garage on a first-come, first-served basis. 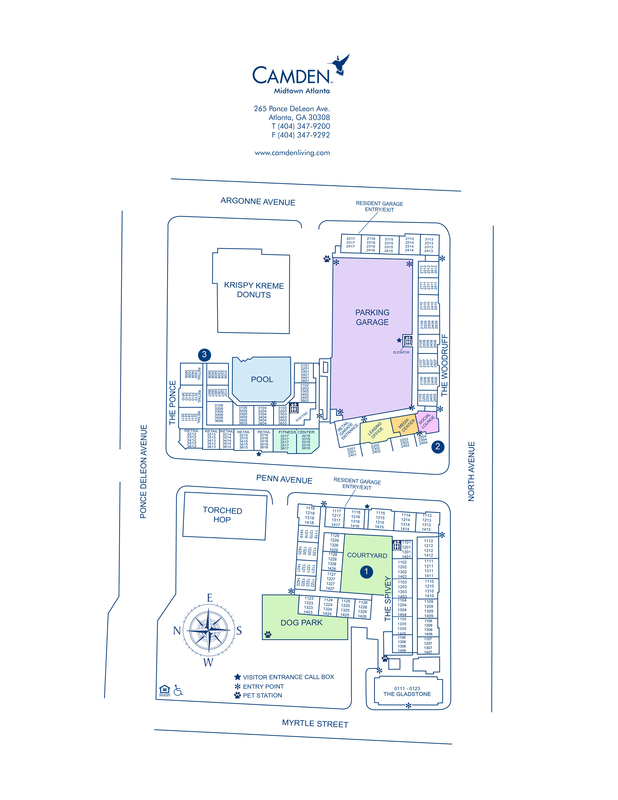 All visitor parking is available on level 1 and 2 of the main parking garage.